The ancient Amazon archives reveal their deepest secrets to the outside world once more, as we continue on our journey to the 75th anniversary of Diana Prince. “Classic Wonder Woman” this week presents; Wonder Woman (volume 2) #213. Written by: Greg Rucka. Cover art by: J.G Jones. Interior art by: James Raiz. Released April 2005. This week’s illuminating issue is titled “Counting Coup” and is part two of a thrilling tale that sees Olympus Gods, Zeus and Athena clash. With Diana enmeshed in the conflict she finds she must face the threat of Zeus’ bodyguard, the one hundred armed, fifty headed beast known as Briareos. Another stunning issue from the awesome Greg Rucka, with an absolutely sublime cover illustrated by the talented J.G Jones. 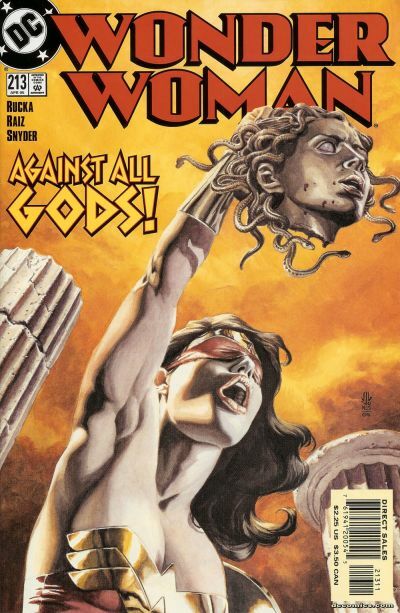 My favourite tales of the Amazing Amazon are always the ones that deal with the Olympic Gods and Greek mythology, and Rucka’s remarkable run on Wonder Woman wrought many great mythological narratives. Join us again next week for another classic WW cover, my astounding Amazonian associates!